Fire Press Release - Urban brush fire stopped from destroying homes. At 7:00 PM this evening, Sunday, July 22, 2012, Spokane Fire Department's Engine 2 was dispatched from their Logan Neighborhood station to a reported brush fire at 50 E. Euclid. As they approached the area a large column of smoke was visible as well as a large volume of fire involving brush and trees on a steep hillside behind the address. As Engine 2 arrived on scene they reported the fire also involved a detached garage and wood fence and was threatening several houses. The incident was upgraded to a working fire, adding three engines, two ladder trucks, one pumper/ladder, one heavy rescue truck and two battalion chiefs. While the additional resources were enroute, Engine 2's crew advanced hoses to protect the exposed houses. As the additional crews arrived on scene they were deployed to extinguish the garage fire and the fire on the hillside, as well as numerous burning objects such as the fence and a hot tub. The fire was knocked down within fifteen minutes, and final extinguishment was completed two hours later. Crews will return to the area throughout the night to check for any hotspots on the hillside. 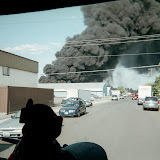 In all, twenty-eight firefighters responded to this incident, as well as multiple units from the Spokane Police Department. AMR dedicated one ambulance to the incident, but thankfully, there were no injuries to any civilians or firefighters. The fire was investigated by Captain Kevin Smathers of the Spokane Fire Department's Special Investigation Unit. He determined the cause to be children playing with a lighter, which ignited vegitation on the hillside. The ensuing brush fire raced up the steep hill, igniting the garage and other improvements. Damage was confined to the detached garage and its contents, a fifty foot section of wood fencing, a hot tub, and approximately one quarter acre of brush and small trees.